Are there any better colors for Valentine's than pink and chocolate? Throw in Rich Razzleberry and this is a delicious combination. For the Splitcoaststamper's color challenge this week, I started with a Basic Grey paper from their Indian Summer line. Using a little gold (which I'm counting as a neutral) tied the colors to the paper. 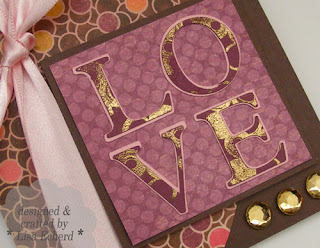 To get a little gold embossing on my Cricut cut letters, I stamped with a small swirly stamp and then embossed with SU! gold embossing powder. That stuff melts quick! The gold rhinestones were purchased in the jewelry making section at Hobby Lobby. Super cheap and easy to attach with glue dots. BTW I was just over at basicgrey.com to verify the name of this paper collection. They have completely revamped their site and added fabric! Or at least I didn't know they carried fabric. I'm going to have to spend some serious time browsing their site. 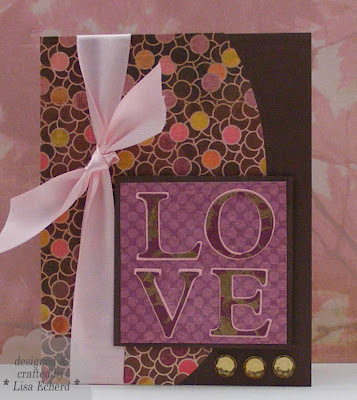 Ingredients: DSP: Indian Summer collection from Basic Grey; Razzleberry Lemonade from Stampin' Up!